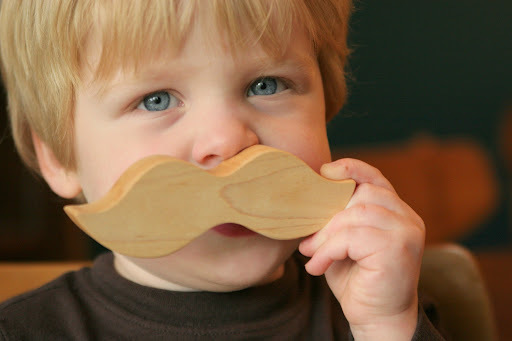 The picture pretty much speaks for itself, but I guess I'll go on to say that this wooden moustache teether from Little Alouette is one of the cutest teething toys I've ever seen. You'll no doubt get a kick watching your baby chew through this humorous ode to facial fringe, and once the gnawing phase has passed, your little guy can use it as a toy disguise which will evoke many a chuckle. Little Alouette's teethers are handmade from locally sourced hardwoods and finished with certified organic flax seed oil, so there's no need to worry about harmful toxins or BPA during baby's teething time.